This is a single-player, first-person, space shooter where the object of the game is to achieve a score high enough to be recorded on the high score table. The player takes the role of a mercenary hired to keep the space lanes clear. This means dropping into sector after sector of space and destroying any ship that is present. The limitations are that the canon will overheat if overused and that each sector jump uses fuel which must be replenished by visiting a star base. In combat there is the tactical scanner which looks like a red radar screen. This gives an indication of the position and number of enemy ships and, when combined with target direction indicators in the targeting window, help the player blast the bad guys. The game is played out in the cockpit of the ship and is entirely mouse controlled. The mouse functions in two ways. In 'ship' mode moving the mouse steers the ship while the left mouse button fires the canon. 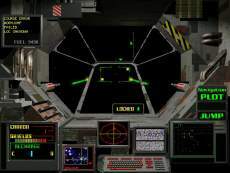 The left mouse button toggles between this mode and 'cockpit' mode in which the player can select either the 'Eject' button to end the game or the 'NavTrack' screen in which the player selects the next sector to jump to.